Jamie got up early this morning, for a wonder...but there was a reason. He fell asleep yesterday afternoon, and we just put him to bed, so he never had any supper, and slept all evening until six this morning. and, (3) Chocolate chip cookie dough ice cream. Not all at once, I'm happy to say. One at a time. First the chips and pissant sauce, as we often call it around here. Then the vinegar chips. Then the chocolate chip cookie dough ice cream. The breakfast of champions, as you can see. Jamie's definitely a teenager, with a teenager's ravenous hunger and disregard for what foods are most appropriate at what times. I should talk, though. I think leftover cold pizza is one of the best breakfasts of all. Of course, I should have taken the time to fix him a proper breakfast, cereal, fruit, perhaps bacon and eggs. It would have been the pc thing to do. No one would ever accuse me of being the wildest person at the party, or the outrageous free spirit at the bar. I'm almost painfully conventional, and I know it. I'm a happily married WASP, father of three. Rather than a rebel without a clue, I'm Mr. PC on a PC. I want the rain forests to be saved--mainly because if they die they will take the whole ecosystem with it...but I'm not active in any organization to stop it. I am against any needless cruelty to animals in testing, but I am not against animal testing per se, if that's the only way. (I would sacrifice any number of animals to save a single human being.) I think it's ridiculous to slaughter animals for their gleaming pelts in this day of synthetic fibers, but I have no desire to demonstrate for it. 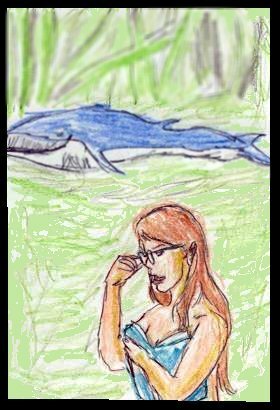 I suppose the ultimate pc picture would be a whale somehow beached in the rain forest, attended by a beautiful (as in Vargas Girl-level beautiful) female marine biologist who one admires for her mind, not the fact that, to protest animal pelts being made into furs, she traipses around naked or near-naked. But never revealing anything (unlike the aforementioned Vargas girls)...of course. Here's a basically un-PC subject; what happens when someone dies on a plane? Think about it. You are miiiiiiles above any place to bury or store the body. What do you do, store it in a cargo hold? I found out yesterday, but I had trouble believing the answer. The flight attendants pretend the corpse is still alive, only sleeping. They will get it blankets, caution other passengers not to "disturb" the "sleeping" passenger. One year ago today: DAYS OF DISCOVERY .